In this process of “coming clean,” decluttering has made the biggest impact. I’ve said many times that I’m in no position to give advice. I’m a slob who is working hard to change and I share my struggles on this blog. I’m figuring out what works for me and hopefully that can help someone else figure out what works for them. In the past, when I would look at a drawer-full, or a closet-full, or a room-full of junk, I’d get overwhelmed. I could do the big stuff, but when it got down to those potentially useful items, I was stuck. All of the “what ifs” would flood my mind and it was hard to let go of things. While decluttering kitchen drawers last month (which were completely full of junk), I came up with two simple decluttering questions. I’ve seen lists before. You know, the ones where you ask yourself a series of questions to decide if you should keep something or chuck it. I think that these will be the questions I’ll ask myself after my house is de–slobified. In my mind, they’re maintenance questions, decluttering questions for normal people. But I don’t have time to spend 5 minutes per item. I have (had) rooms full of stuff, so I have to be able to work quickly to keep from getting distracted. Like I said, I don’t want to act like some kind of expert, but these two questions have helped me and have inspired quite a few comments from people who say they’ve helped them as well. So I thought I’d put them in their own post. If I ever achieve “normal person” status, I will need those long lists of questions to make decisions about tough items. But as long as I need to get rid of 7/10 of all the stuff in this house, I need a shorter list. One that doesn’t contribute to my feeling overwhelmed. Check out my decluttering page for more ideas and inspiration on how to declutter! 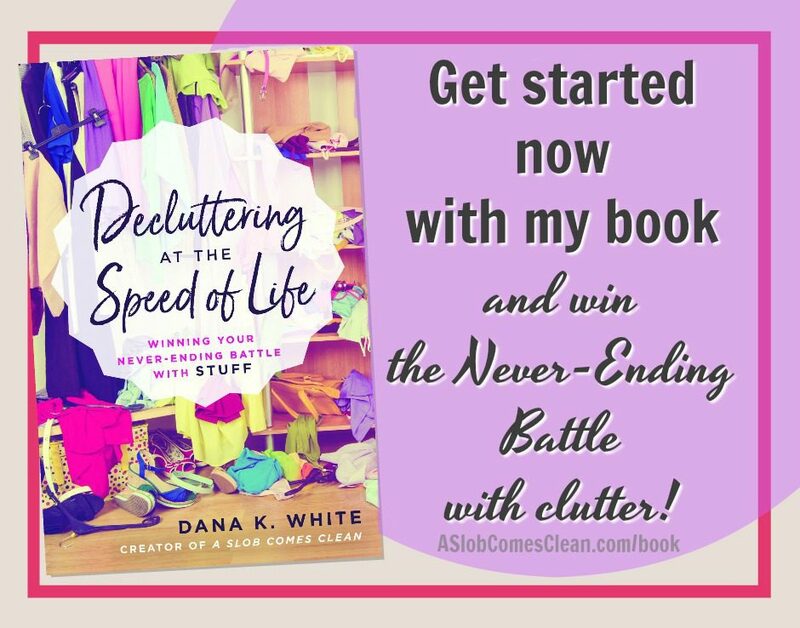 My newest book, Decluttering at the Speed of Life is now available wherever books are sold! Does even the thought of decluttering overwhelm you? Sign up for my newsletter and get my reality-tested decluttering solutions delivered to your inbox for free. Read Older Post Painting My Daughter’s Bookshelf/Dollhouse! Thumbs up – I love those questions!! I especially like that first one! Perfect questions. I can so, so, so relate to the frustration of decluttering! Thank you for sharing! You're doing a great job! I've really enjoyed reading of the progress you're making…and even of the struggles. And the best advice comes not from those with head knowledge, but from those who have been there, done that. LOVE those questions. Every time I asked myself if I had used something in the past 6 months, year, etc., I would think, "Well, I would have if I'd known where it was!" Which of course then meant that I'd keep it anyway, right where it was, and continue to be overwhelmed. Your first question actually involves forward motion without the guilt/shame. Question 2 confuses me though… maybe because it feels like I already have everything?! The other question that can be asked is "If I am going to keep it to use it, WHY would I store it?!" I donno WHY I would throw everyday things into a storage bin and hide it into a closet…pens, erasers, scissors, tissues…really? LOL! Those are great questions! Especially the first one. That will help me know where to actually put some things!!! My favorite question for decluttering is: Would I buy this item, FULL PRICE, if I didn’t have it already? Oh that is a GOOD question Amanda. Of course, I would virtually never buy anything at full price. Working in retail for six years made me too aware of mark-ups, and sale schedules. But, the concept of “would I buy this today?” is the one I have just started using with clothing decluttering. Its dynamite! Today I decluttered a box of junk I’ve been moving around my house for at least 3 years. I’m pretty excited. I actually gasped out loud when I saw the bottom of it. And since I actually did put/throw things away as I went (thanks to the space time continuum post) it isn’t just spread in piles on my bed. Joy. OK, I think I need to also read the space time continuum post! Where can I find that? Thanks!!! Despite the junk, I have an amazing mind for what I already have. My most recent duplicate purchase was frozen green beans. I waited three years for my mother to find the heat-gun rather than buy my own. The inverse of this is that having certain items keeps me from even looking at coupons, much less get another on-sale. I agree! I’m a pack rat at heart. Putting all this stuff “away” is what got me into this predicament of having more stuff than I can handle. I have to first decide whether I’m going to keep an item, then put it in its home. Thanks for all your encouragement, Dana! I can’t begin to tell me how life-changing your blog has been to me since I started following it about a year ago–who knew there was an hope for this 65-yo “slob”? Your 2 questions: I totally get the 1st one & am learning to automatically use it. The 2nd question, though, isn’t as clear for me. If I’m currently looking at the object, then obviously I know I have it & assume I’ll remember I do if it’s in the right place (per ques #1). What am I missing? Technically, it is a question of “did” you remember you have it. Was it a total surprise when you found it? So the key is this: If you didn’t know that you had it, you’d never have looked for it. You’d have gone out and purchased another one. Then you would have two. Does that help? I found your approach refreshing! AND LIBERATING! That is exactly how I think! I didn’t realize till I read the post that I declutter smaller areas that way all the time–my purse, my teaching notebook, etc. Don’t know why I didn’t think of doing the same thing with my house. THANK YOU! I love your response Nina, I hadn’t thought of doing all the little things on an ongoing basis. I was really just considering the “big jobs”. Thanks for posting! Just found this quote made me think of your deck uttering questions. Excellent questions! I’m writing them down now and am going to post them on my refrigerator so that everytime I walk by it, it wil click my mind into “declutter/cleaning” mode. Thank you! Thank you so much!! <3 Anyway it may be a different experience for every single person, I think. Having a friend help you really will help here, I think. Don’t touch the things yourself, because psychologically we are more inclined to cling to things we are already holding, and then close your eyes/turn your back to your wardrobe whilst your friend describes the item to you. You should be guided pretty quickly to a keep/donate decision here (don’t second guess yourself), especially if you’re not allowed to open your eyes, or if you have to hold your breath, until you’ve made a decision. That way the really special things will still be kept, but there’s not so much that it’s overwhelming. These are the questions I use. 1) What is it? ~ Defining the item out loud or in my head helps me face if its worth finding a home for it. If it is trash or donate that’s a quick fix. If it is an item I need/want I go to #2. 2) Does it have a place? ~ If its “yes” then I take it there. If its “no” I think of what the logical place to keep it is. These are great questions. As I look around at my container and realize that I have no concept of the actual size of my container I know I have to ask these questions but my mind falls on another question. What if the answer to the first question is I would look for this item in the office but there isn’t any room in the office? And it isn’t a visible space so it isn’t an area I’ve tackled. And adding more to that space doesn’t make sense to me. So I do nothing which doesn’t solve the problem. How do I stop the circular reference and make progress? Then you put it in the first place you’d look for it. The answer to question number one. Great questions! The place I really run into issues is when I find things I don’t want anymore, but they’re not good enough to donate, but don’t seem bad enough to throw away. What do you do with that stuff? Or am I just crazy? If they really aren’t good enough to donate, then they are trash. But if you’re talking about clothing, there are some donation places that take imperfect (but clean) clothes to sell to ragmakers. Please help me with question #1. Hi! I’m really enjoying your podcast because you sound just like me!!! I am a little confused about your declutter questions though… how does the first question help you actually declutter? In my mind, it seems like it would help me organize and clean up, but not actually get rid of anything. Maybe I’m not understanding..
the problems you’ve had, are the problems I’ve had all my life. But if I hadn’t cleaned my room to perfection, I felt I failed. I wish I’d discovered your realization when I was your age. into use…it’s never too late!